You may not still be thinking about the debt-ceiling debate, but I am. That’s because we will be having it again soon. 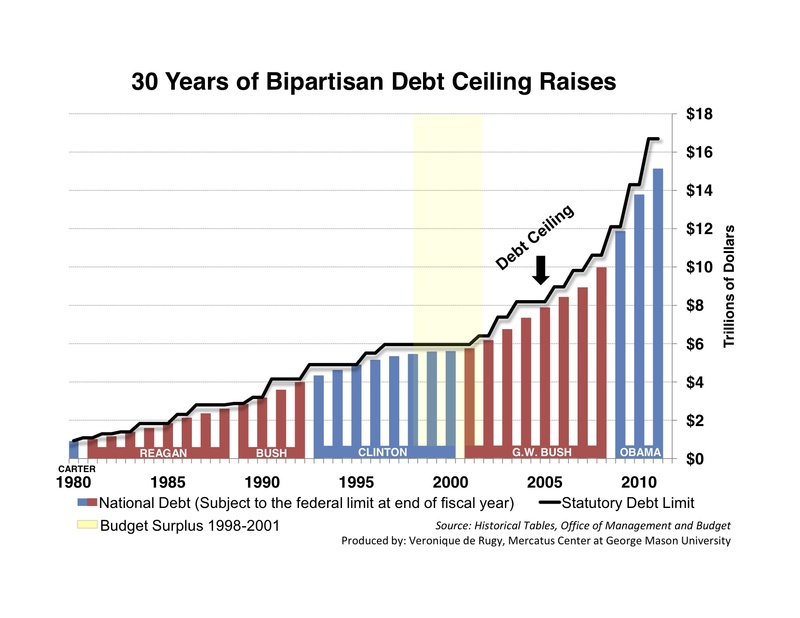 This week’s chart looks at 30 years of raising the debt ceiling, and it seems to indicate that, without institutional and fiscal reform, lifting the borrowing ability of the federal government just leads to a perpetually increasing federal debt and more barriers to economic growth. Since 1980, the debt limit has been raised 39 times: 18 times under Ronald Reagan, four times under Bill Clinton, and seven times under George W. Bush. President Obama has raised the debt-limit four times, most recently to $16.4 trillion. The budgetary surpluses during FY1998–FY2001 (the highlighted region) reduced debt held by the public by $448 billion, but due to accumulations in intra-governmental debt, total federal debt went up by $405 billion over the same period — amounting to the smallest annual growth period in federal debt during this time window. Also, this was the longest period without a raise in the debt limit, which was held at $5.95 trillion.